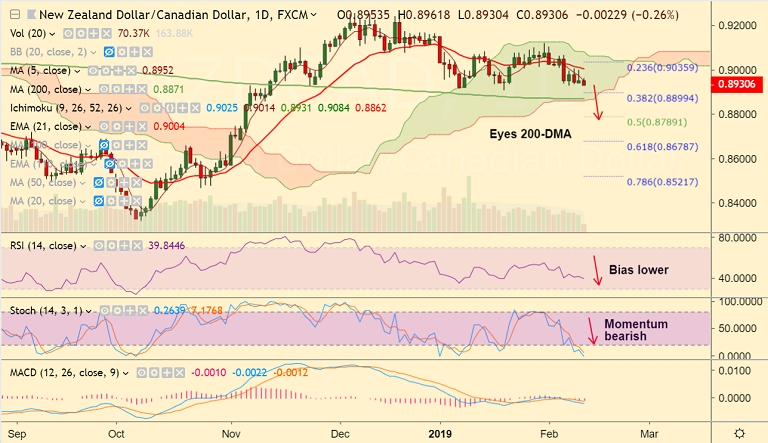 NZD/CAD extends sideways grind along major support at 110-EMA. The pair has been capped below 55-EMA and 5-DMA is sharply inclined north which supports further downside. Momentum indicators also support downside in the pair. RSI and Stochs are sharply lower. Break below 110-EMA will see dip till 200-DMA at 0.8871. Violation at 200-DMA could see further weakness. Upside remains capped at 55-EMA, break above could see upside till 23.6% Fib.